Signature reflects your identity and information to the mail receiver. Mail sender can quote text, contact number, and other information as he wants to share. Without the signature, a mail lost its importance. According to my opinion, there are two types of mail, first official and second un-official. Both types of mail may be important. Basically, official mail is more important than unofficial. What is the importance of Signature in the mail? The reason behind this, unofficial mail sender know the person and have the contact number with all details. So, he can get confirmation about context by phone. But official mail sender only identifies the person by signature with other details. For example, if any person applies for the job via E-mail and did not give his signature with other detail. How an employer may personally contact him. At the time of verification, the person may face a problem to convince them, if signature verification is done. Your appended signature of outgoing messages flashes positive image and believe to the receiver. Always write the mail with your full details and contact number. 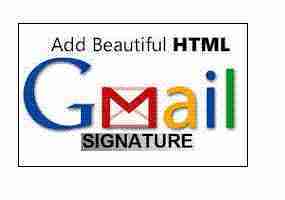 How activate Auto Signature option in Gmail account. First on a computer and open your G-mail account and email sign in G-mail account. Just click on the setting icon, which is given on the right sides, like the wheel. Now select settings option. Scroll down the “Signature” section. You will get the signature box with the default setting “No Signature” option. Now click on the second option and write new signature text with all details like - address, mail id, name, contact number. Use the ‘Sans Serif’ option to change the font as per choice. You can insert image, hyperlink to make the signature with the decent look. Now click on save buttons at the bottom of the page. Your all mail will automatically add the signature with image and content. How to Add an Image from web or Google drive in Mail. First got the setting option and click on insert image. Insert a web URL after taking confirmation to use the image. How to add a signature with contact details to the Different E-mail account or address. G-mail has provided the option to add a signature with the different e-mail address. You have to use the option as given in setting. Other plus points are here that you can add the different signature for each address. To select an address, opt to drop down menu above the signature text box on the setting page. Now go with the Account tab. Check your address is listed in “Send Mail As” section. Basically, you have to use 10,000 characters only in the signature. So, be careful, mention all the relevant details, which are important for the receiver. If you face any trouble during the implementation of the application, share with details in Discuss.